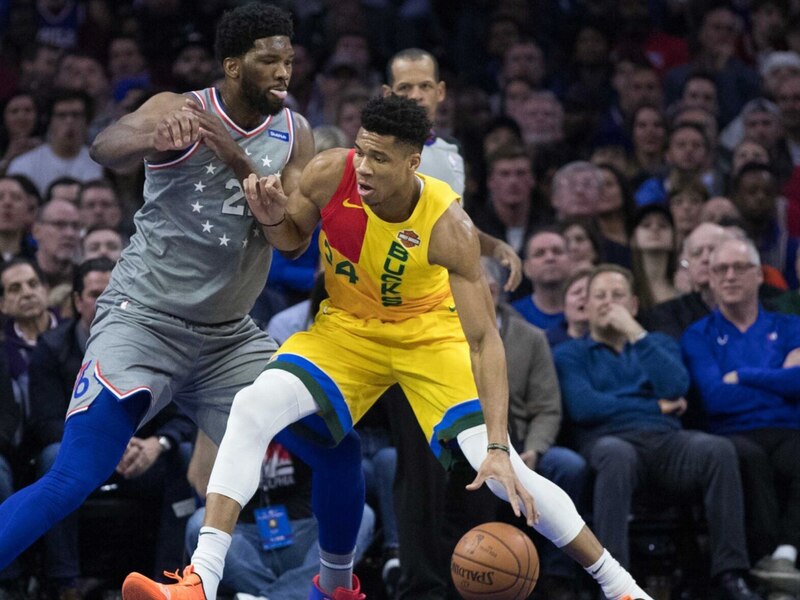 The Philadelphia 76ers hosted the Eastern Conference’s best team in that of the Milwaukee Bucks Thursday night. For a late-season game between two of the best squads in the NBA, this was rather meaningless. Milwaukee was a win away from wrapping up the top overall seed. Meanwhile, Philadelphia had already clinched the third spot. Even then, the game itself inside the Wells Fargo Center was about as electric as it gets. Bryce Harper rang the opening bell. Bucks guard Eric Bledsoe and Sixers star Joel Embiid got into within the first few minutes of the game. Bledsoe himself was tossed. As the game continued, it became rather clear that this is the playoff series we need back east after Milwaukee clinched homecourt with a 128-122 win. Embiid vs Giannis: The two were just going at one another. Embiid blocked Antetokounmpo one time throughout the game with the Greek Freak returning the favor twice. One could say they were pumped to go up against one another. When all was said and done, Embiid notched his second triple-double of the season with 34 points, 13 rebounds and 13 assists. Not backing down, Giannis went for 45 points on 13-of-22 shooting with 13 rebounds and six assists. Bad blood: That’s not going to end come playoff time. Don’t think for a second that Embiid and Bledsoe are simply going to forget what happened here. They aren’t. The drama-filled landscape of the playoffs will only add to the bitter feelings the two sides have after Philadelphia’s late-season home loss. We’re highly intrigued to see if any Sixers players respond to Bledsoe outside of Embiid himself. Maybe Ben Simmons? The matchups: It’s not just about Embiid vs Antetokounmpo. Jimmy Butler and Khris Middleton went at it throughout the game. Both are crafty on offense and represent reinforcements on the other end of the court. Assuming Malcolm Brogdon returns from injury in time for an hypothetical series, we love his matchup against Ben Simmons. At 6-foot-5, he gives up some size. But he’s a much better matchup against the 6-foot-10 Simmons than most. Everyone wants to see the Celtics and Sixers go at it. That would be an awesome rivalry series. However, this set would represent new blood going up against new blood in a reformatted Eastern Conference. Embiid and Antetokounmpo will be going at it for years moving forward. Why not start this rivalry now? If what we saw Thursday night is any indication, we’d be all for it.